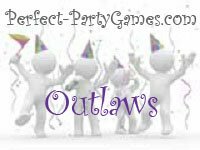 Summary: Outlaws is a game like Capture the Flag, but on a very large scale. It involves capturing people as well as the flag. The highest-value people are the two captains. The captain of one team is Jesse James and the captain of the other is Frank James, Jesse's brother and partner in crime. So, even if you don't manage to snag the other team's flag, it is still possible to win, provided you capture enough of the other flags. An excellent game for amusing large numbers of people for an hour or so. Outlaws is played over a large area, like a park or a part of a college campus, but without defined team territories, just an outer boundary. Ideally, the topography is varied. It would have trees, bushes, rocks - you know, places to hide and ambush. If playing in a more urban environment, make the rule that going indoors is not allowed. Make sure the outer boundaries of Outlaws are crystal clear. An example would be 14th Street including 14th Street and from the edge of the cornfield to the river not including the river. 4) Each player tucks a flag into his waistband. The flag must be easy to pull from the wasitband, not tied on in any fashion. Frank and Jesse forgo the waistband flag and wear the flag tied around their foreheads. 5) Give each team one of the big flags. 6) Create a "No Man's Land" - just a small marked off neutral territory somewhere in the middle of the playing area. 7) The remainder of the small waistband flags go to the neutral scorekeeper who presides over No Man's Land. This person has three inportant functions: to hand out more waistband flags to those who have had theirs stolen, to keep score and to keep track of time. 8) Decide on a time limit for the game - half an hour is fine. Or a whole hour if your players have major league stamina. Everyone begins in No Man's Land. Give the teams a few minutes at the start of the round to hide the big flag. Approximately five minutes is sufficient for a smaller terrain, but more like ten if using a really spacious area. For instance, if the game was to be an hour long and hiding the big flag is going to take 10 minutes, and it was 1:00...then the scorekeeper would let everyone leave No Man's Land at 1:00, allow for the 10 minutes prep time, and the game would end at 2:10. The hiding places must be within reason: nothing too high or buried in the earth or pinned to a moving vehicle, for example. An ideal place would be in a visible but slightly hard-to-access spot, like draped over a large rock or up in a tree. Then the clock starts the game of Outlaws begins. The object is to capture the other team's large flag and as many of their smaller flags as possible. Frank and Jesse roam with posses of body guards; foot soldiers dash about looking for flags; everyone tries to capture other flags and hold on to their own. If your waistband flag is snagged, you must walk, not run, to No Man's Land to retrieve a new flag from the scorekeeper. No one is ever "out" in this game. Once a player has gone to No Man's Land and received another flag, that player jumps back in the fray. Even a captain may play again. No one may steal a flag from someone while IN this neutral zone. Captured flags should be given to the scorekeeper. She will collect them, mark down the points, and re-distribute them as needed. When time is up, the scorekeeper can no longer accept flags of any kind. The points as scored at that moment stand. If the big team flag is stolen, the game ends when that flag arrives at No Man's Land. The points are then tallied. If you have a VERY large crowd, you may wish to adjust the point system. The team that has accumulated the most points during the appointed time of play, wins.